According to many, Anglia offers the best selection of books in English in Russia’s capital, providing its customers with contemporary fiction and lots of non-fiction books on different topics. Especially the non-fiction section is said to be well supplied (history, social sciences, economics, books on art and photography), with the fiction section still limping behind a bit in terms of selection. Full customer service for books currently not on stock is available. New books in this store are quite expensive however, and that’s true even in comparison with prices in UK or USA. Still, Anglia British Bookshop can prove to be the right destination even for book-lovers traveling on a budget. In September 2004, Anglia launched a special project in cooperation with a British volunteer charity organization “Action for Russia’s Children” (ARC), which aims to raise funds for under-privileged children. Thus you can buy used books in English language from ARC volunteers on Sunday afternoons from 13 to 16 at Anglia. Open since October 25, 1997 in Khlebny Pereulok, moved to its current location in a rather quite side-street in the center of the city in June 2003. Staropimenovsky and Vorotnikovsky sidestreets corner is easy to get from either Pushkinskaja or Mayakovskaya metro stations or Sadovaya-Triumfalnaya or Tverskaya streets if you drive. Anglia has branches in Samara and St. Petersburg as well. I have attempted to visit the Saint Petersburg location of Anglia Bookshop and was completely unable to find it! I stood in front of the building, number 38 Fontanka, and it just wasn't there. I had even called in advance asking for directions, so apparently it exists -- someone answered the telephone, right? Very frustrating, since English language books are rare in this city. Anglia in Moscow is closed and is no longer in the old location. 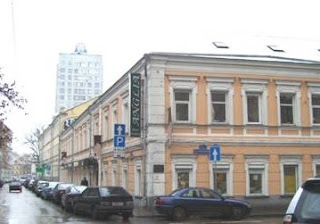 The new name is Bookhunter and they have relocated to 9 Krivokolenny Per., Building 1, Moscow. Unfortunately I did not learn this soon enough and tried to find it at the old address.